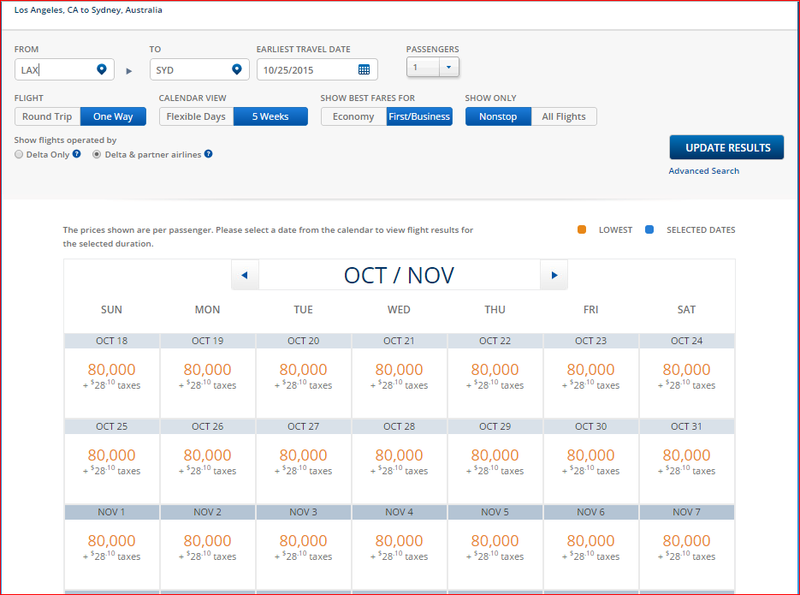 Part 1: Delta SkyMiles 2015: Agonized, Tantalized and Analyzed Part One — What You Really Need to Know! A few months ago, I wrote two posts about much improved Delta SkyMiles international business class award availability, but they weren’t without a few shortcomings. First, I only checked flights out of New York City. Second, I only checked flights to Europe. 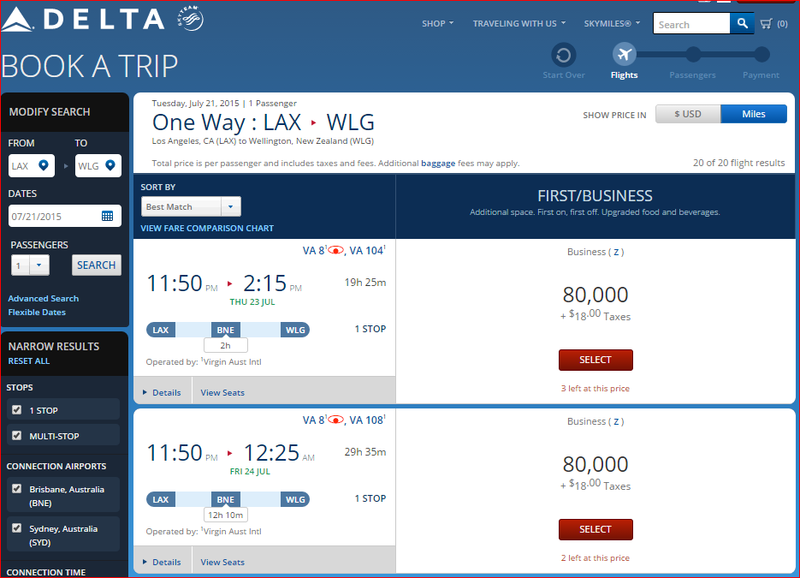 And third, I was only paying attention to the flights that had roundtrip availability because I couldn’t imagine that this availability would last until 2015 when one-way travel on Delta would become available. And yet, here we are! One-way flights are here, and availability is still spectacular, well, for most parts. Delta Business Award Availability Next Summer Is Still Blowing Me Away! 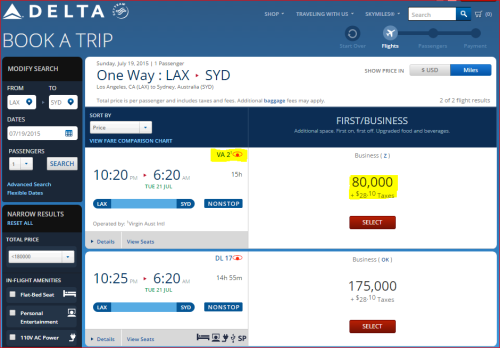 So, in this installment, I intend to get out of my NYC shell and check Delta SkyMiles international business class availability from all Delta hubs in the US for the next summer. Since I’m not a bot and thus can’t cover everything, here are my standards (just because I should have some, I’ve heard). Here is what I consider to be a perfect combination. Summertime travel, which is notoriously difficult to book for a business class award to Europe (I’ve chosen dates between July 19 and August 22, 2015). At least 5 flights should be available within a 5-week window. At least two or more seats should be bookable on the same flight. Tall order you say? We’ll see. Of course, there are shortcomings to this process, but there are shortcomings to everything. At some point, you have to choose your methodology and stick with it. Also, it goes without saying that these findings are far from absolute. Award availability is totally fluid, and when you do your own search, you can find a completely different picture. Still, availability has been good for a few months, and not only that, it has become better (for JFK, that is). Hopefully, it is not going to be killed overnight. Excellent non-stop business class availability (at least 5 departures in a 5-week period) for at least two people. Good non-stop business class availability (at least 3 departures) for at least two people, or excellent availability for 1 person. Limited non-stop business class availability (1-2 departures) for at least two people in both directions, or good availability for 1 person. 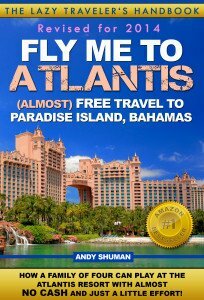 No non-stop availability for two people, might have some availability for one person or for a flight with stops. TLV (Tel Aviv): Couldn’t find non-stop availability at the time of search, but plenty of availability with a layover. CRU (Sao Paulo): Excellent outbound availability for two people, none on return. BOG (Bogata): Excellent availability in both directions. Note: London is also served by Virgin Atlantic, whose Upper Class product is reportedly superior to Delta. Virgin Atlantic flies between London and the following cities in the US: New York (JFK), Newark (EWR), Atlanta (ATL), Los Angeles (LAX) and Washington, DC. Delta has good to excellent award availability on Virgin Atlantic (except Seattle), so this is your chance to sample Virgin Atlantic product without paying insanely ridiculous fuel surcharges for the privilege. 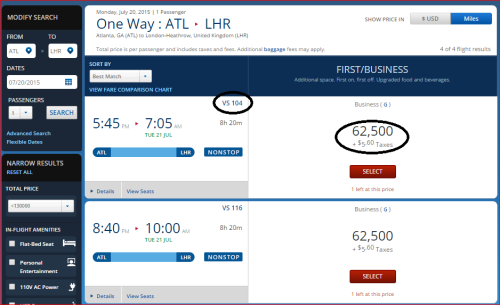 UPDATE: thanks to readers ShoNuffHarlem and walterj for alerting me to VS flights from Miami (MIA) and Chicago (ORD) “with connecting flights to Edinburgh and other Scotland cities” (in summer). There are three international flights out of Newark. AMS: Limited outbound availability for two people, excellent on return. Excellent outbound availability for one person. LHR (starts on March 29, 2015): Excellent availability in both directions. CDG: Good availability in both directions. GRU: Excellent outbound availability for two people, good on return. GIG (Rio de Janeiro): Good outbound availability for two people, none on return. DXB (Dubai): Excellent outbound availability for two people, none on return. EZE (Buenos Aires): Limited outbound availability for two people, none on return. SCL (Santiago de Chile): No non-stop availability at the time of the search, but plenty of availability with a layover. LHR: Excellent non-stop business class availability for two people in both directions. FCO: Good to excellent non-stop business class availability for two people in both directions. FRA: Good non-stop business class availability for two people in both directions. AMS: Limited outbound availability for two people, excellent on return. GRU: Excellent outbound availability for two people, limited on return. 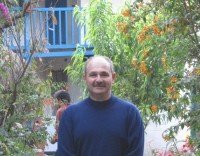 NGO (Nagoya): Excellent outbound availability for two people, none on return. PEK (Beijing): No availability for two people, but plenty for one person. PVG (Shanghai): No availability for two people, and limited availability for one person. CDG: Good non-stop business class availability for two people in both directions. LHR: Good non-stop business class availability for two people in both directions. 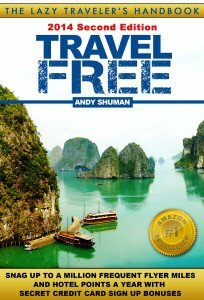 AMS: Limited on the outbound, good on the inbound; excellent availability for one person. CDG: Limited in both directions; excellent availability for one person. NRT: No availability for two people, but plenty for one person. AMS: Excellent non-stop business class availability for two people in both directions. CDG: No availability for two people, but plenty for one person. HND (Tokyo): No availability for two people, but plenty for one person. SYD: Excellent non-stop business class availability for two people in both directions. Note: This is your chance to fly to Sydney and beyond on Virgin Avstralia with no fuel surcharges. 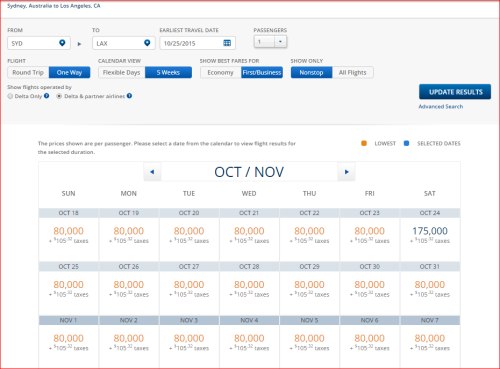 There is an UNRELENTING availability in both directions from March until late November (which is the end of the Delta SkyMiles calendar at this point). 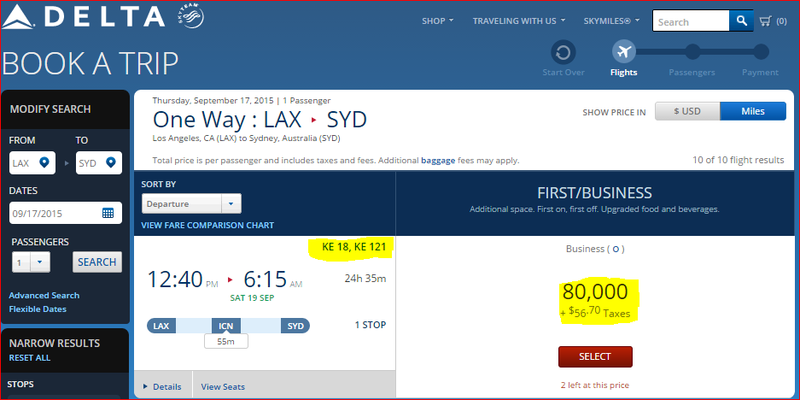 If Virgin Australia is too boring to you (LOL) or you want to test other products, break your trip with the famed Korean Air business class product, although you are going to have to pay a whopping $28 extra in taxes. But, what the hell! Splurge. Virgin Australia can also take you to New Zealand via Brisbane. This is the point where a stopover could be useful, sigh… Although, I do hear rumors that Delta CSRs have been allowing folks use stopovers for now. Can it be true? There appears to be a very poor Delta business class, nonstop award availability in Europe from Seattle. I checked the entire 2015 and found not even one J class award to London at the Saver level. Quite ridiculous, I must say. AMS: No availability for nonstop flights. ICN: Appears to be the only bright spot. 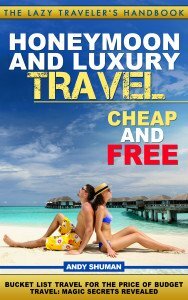 Excellent non-stop business class availability for two people in both directions. PEC: No availability for two people, but plenty for one person. HKG: No availability for two people, some availability for one person. So what’s your opinion? Better, worse, same? Share your thoughts here. 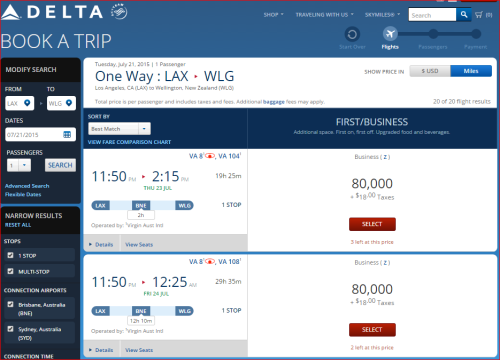 ← Delta SkyMiles 2015: Agonized, Tantalized and Analyzed Part One — What You Really Need to Know! Great analysis, nicely presented and simple to understand. 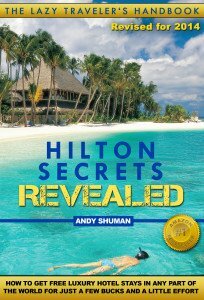 This series of articles on Delta are turning out to be great reading, Andy. Kudos. Great coverage! Now I’m contemplating if I should start accumulating Delta miles!! Thanks. I’m torn between transferring my MR to Avios (with bonus) and Delta. Yes, it does, although VS, not VA. Thanks, I’ve missed that. Virgin Atlantic also has summer service from ORD with connecting flights to Edinburgh and other Scotland cities. Thanks for your comment. Updated post.